Authors: Raju Vaishya , Vipul Vijay , Abhishek Vaish , Amit Kumar Agarwal . Department of Orthopaedics and Joint Replacement Surgery Indraprastha Apollo Hospitals Sarita Vihar, New Delhi 110076, India. Anterior cruciate ligament (ACL) injuries are common sports injuries. While the treatment of complete ACL tear is clearly delineated and are often treated with ACL reconstruction, the treatment of a partial injury to the ACL is still a matter of debate. Partial tear of an ACL is a relatively rare injury. The reported incidence of partial ACL injuries ranges from 10-28% (1). There are studies which have tried to outline the natural history of partial ACL tears. It is reported that there is a 15% to 66% chance of this lesion to progress to a complete tear. The incidence of secondary cartilage injuries has been estimated to be between 15% to 86% (2,3). Even though there is consensus on the progression of the instability and the occurrence of secondary cartilage injuries, the management, including the timing and type of intervention, are still under debate. In the present article, we have done a critical review of the literature regarding the management of partial ACL tears. A precise definition of a partial ACL tear is lacking. Hong et al. described a partial ACL tear as one where less than 50% ligament is torn (4). On the other hand, Noyes et al. described the partial ACL injury by the ACL left after the tear (5). It was based on the finding that the loss of 50-75% diameter of the ACL would lead to the significant incidence of clinical failure. Some authors have also tried to assess the grading of the injury by arthroscopic findings (6).DeFranco and Bach have attempted to define the partial ACL tear by a combination of clinical, knee laxity and arthroscopic criteria (7). Barrack et al. defined a partial ACL as a lesion in which the three criteria were fulfilled. These included a pivot shift test being negative, the Lachman test being 0 or 1+ and a significant portion of any of the two bundles being intact on arthroscopy and found to functionally active, as confirmed by arthroscopic anterior drawer test (8).Functional anatomy of ACLThe ACL has been found to be comprising of two bundles, namely the anteromedial (AM) and posterolateral (PL) bundle. The two bundles have been labeled by their insertion of the femur. The AM bundle is isometric whereas the PL bundle is anisometric and changes length as per the position of the knee. The anterior fibers of the AM bundle are taut during 30 to 130 degrees of flexion. Conversely, the posterior fibers of PL are completely taut in extension and beyond 90-degree flexion.This unique configuration is responsible for the differential effects on knee stability of the injury of the two bundles. The AM bundle contributes majorly to the anterior stability of the knee in normal activities of daily living. The PL bundle contributes more to the rotator stability and is responsible for stability during activities involving pivoting. The differential functions of the two bundles lead to different sets of presentation in patients with partial ACL injury depending on the bundle which is injured.The AM bundle is easily visualized in all knee positions, and it is this reason that some isolated PL bundles are often missed. To clearly assess the integrity of the both the AM and the PL bundles, the Cabot’s position (Figure of four position) was described (Figure 1). In the Cabot’s position, the AM bundle can be visualized wrapping around the PL bundle and hence the integrity of both the bundles can be individually assessed (9).Advantages of retaining a native ACLThere are various potential benefits of retaining the intact portion of the ACL: 1. The retention of the native ACL helps in preserving the blood supply to the ligament and may lead to potentially better healing capacity (10).2. The presence of mechanoreceptors in the remnant can also help postoperative ACL function (11).3. There are chances of increased biomechanical strength.4. A study by Bak et al. reported significantly decreased immediate postoperative pain during rehabilitation in patients in whom the ACL remnant was preserved (12). They also concluded that the ACL remnant gives protection to the graft while it is still in its healing phase.5. Also, the preserved ACL remnant acts as a guide for the creation of the bony tunnels and helps in the anatomic reconstruction of the ligament. Diagnosis The diagnosis and identification of a partial ACL tear is a challenge. The diagnosis is usually based on a combination of clinical, radiological and knee laximetric findings along with an arthroscopic correlation.A) ClinicalThe injury is common in young individuals, usually 20-30 years of age. The symptoms may vary with the type of bundle which is injured, varying from feeling of instability in the anteroposterior plane (isolated AM bundle injury) to a rotatory instability in pivoting activities (isolated PL bundle injuries). The clinical examination reveals a Lachman’s test which has a firm end point and has less than 5mm translation. The pivot shift test is usually negative.B) RadiologicMRI findings cannot be completely relied on for making a diagnosis of partial ACL tear (Figure 2). However, it may provide subtle clues to the diagnosis when assessed along with arthroscopic and clinical findings. There are special axial or perpendicular cuts in the MRI which have been described for clearly assessing partial ACL injuries in MRI (13). Colombet et al. described three type of orientation of the partially torn ACL fibers on MRI (14). The “straight fibers” had an orientation which was parallel to the Blumensaat’s line, the “lying down” fibers had fallen and were lying down in the intercondylar notch, close to the PCL and the “disorganized” fibers, which had no structural pattern and had disappeared.C) ArthroscopicArthroscopy helps in the identification of the lesion under direct vision. There have been authors who have suggested the use of arthroscopy for the identification of partial ACL tears (15). However, with the improved understanding of the imaging and clinical findings, arthroscopy should only be used for confirmation of the diagnosis and the surgeon should be ready with the option of reconstruction at the time of arthroscopy. The important thing to underline during an arthroscopic examination of the knee is the essentiality of examination of the knee in the Cabot position (Figure 3), wherein both the ACL bundles can be identified separately.D) Objective laxity measurementThere are many studies which have studied the anteroposterior plane laxity for complete ACL injuries using KT 1000. Since partial ACL ruptures may sometimes lead to pure rotational instability; the diagnosis may be difficult to identify using the conventional laximeters. The usual translation in the AP plane for non-ACL injured knee is less than 3 millimeters (mm). A translation greater than 5 mm is suggestive of a chronic and complete ACL tear. Translation between 3-5 mm is suggestive of a partial ACL tear. There have been studies using special laximeters like GNRB® which can diagnose isolated PL bundle damage (16). Treatment – The treatment of partial ACL tears needs to be individualized as per the requirements of the patient. A certain subset of patients may be treated with conservative means. These subgroup of patients include those who are diagnosed by radiologic findings and lack any clinical examination findings. Also, the patients in low demand jobs, involved in activities not involving torsional strain on the knee and sedentary lifestyles may be candidates for conservative treatment (17). Patients who have mechanical signs and symptoms of instability and are involved in high demand physical activities which are likely to put a torsional strain on the knee are candidates for surgical intervention (18). A) Conservative treatmentConservative treatment consists of immobilization immediately after the acute phase of injury till the pain subsides. Further treatment usually is followed along the course of rehabilitation of ACL reconstruction. The exercises focus on muscle strengthening along with proprioceptive training and adaptive training. The most important aspect of the conservative treatment of ACL injuries is a regular and systematic follow-up assessment of instability since there have been reports of conversion of up to 25% partial ACL tears to complete tears (19).B) Surgical treatmentThe surgical treatment entails the use standard arthroscopic techniques and creation of the standard anteromedial and anterolateral portals. The graft selection depends on the choice of the surgeon. Some authors have suggested creating a high anterolateral portal so that there is minimum obstruction of the Hoffa’s fat pad (9). After the assessment of the associated lesions along with the partial tear, they are managed as per the standard protocols. The assessment of the partial ACL tear is done arthroscopically and also through stability tests in both the semi-flexed and the Cabot’s figure. 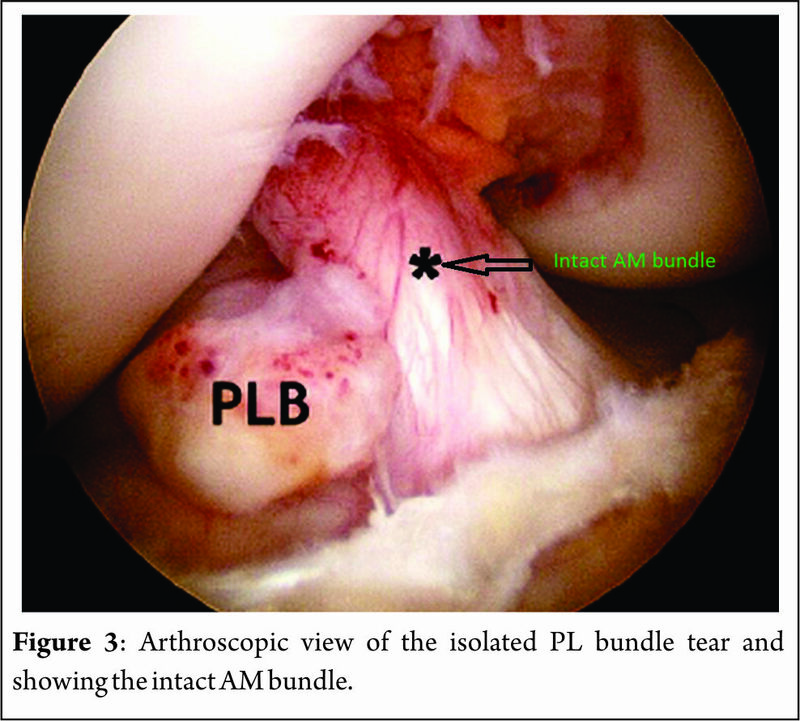 There are certain steps which are specific for the creation of the AM and PL bundles.Anteromedial bundleThe entry point for the creation of the tibial tunnel for the AM bundle begins approximately 1.5 cm medially to the tibial tuberosity and is angulated at an angle of 60 degrees (20). The femoral tunnel is along the fibers of the femoral remnant. Care is taken to avoid excessive debridement of the remnant bundle to provide a scaffold for faster healing. Posterolateral bundleThe entry point of the PL bundle lies more medially and is usually situated 3.5 cm medially to the anterior tuberosity. The intra-articular exit point is located 5 mm medial to lateral tibial intercondylar eminence. Similar to AM bundle, excessive debridement of the remnant should be avoided.Future trendsApart from the role of the single bundle reconstruction, there has been a renewed interest in the use of biologics in the healing of partial ACL tears. The more recently used techniques include the use of growth factors, Platelet rich plasma, stem cells and bio-scaffolds (21). Their use in the presence of partial ACL tears has given good short to medium term results, but further studies to assess their role in long-term is needed.ConclusionsA partial tear of ACL is rare, but a distinct clinical entity, which is hard to diagnose and manage. The clinician and radiologist require awareness about this entity, and a high index of suspicion is necessary to be able to make an early diagnosis of partial ACL tears. Direct examination of the knee by arthroscopy is the most accurate and invaluable modality in the diagnosis and management of these lesions. In low-demand individuals, conservative treatment is effective, whereas symptomatic high-demand and athletic individuals are the candidates for surgical intervention. A single bundle ACL reconstruction is the treatment of choice in these symptomatic patients. Regenerative treatment seems to be a likely option, but lack long-term follow-up to advocate their efficacy, at present..
1. Zantop T, Brucker PU, Vidal A, Zelle BA, Fu FH. Intra-articular rupture pattern of the ACL. Clin Orthop Relat Res 2007;454:48–53. 2. Andersson C, Odensten M, Good L, Gillquist J. Surgical or nonsurgical treatment of acute rupture of the anterior cruciate ligament. A randomized study with long-term follow-up. J Bone Joint Surg Am 1989;71:965—74. 3. Casteleyn PP. Management of anterior cruciate ligament lesions: surgical fashion, personal whim or scientific evidence? Study of medium- and long-term results. Acta Orthop Belg 1999;65:327—39. 4. Hong SH, Choi JY, Lee GK, Choi JA, Chung HW, Kang HS. Grading of anterior cruciate ligament injury. Diagnostic efficacy of oblique coronal magnetic resonance imaging of the knee. J Comput Assist Tomogr. 2003 Sep-Oct;27(5):814-9. 5. Noyes F.R., Mooar L.A., Moorman C.T., 3rd, McGinniss G.H. Partial tears of the anterior cruciate ligament. Progression to complete ligament deficiency. J Bone Jt Surg Br. 1989;71(5):825–833. 6. Lintner D.M., Kamaric E., Moseley J.B., Noble P.C. Partial tears of the anterior cruciate ligament. Are they clinically detectable? Am J Sports Med 1995 ; 23 : 111-118. 7. DeFranco M.J., Bach B.R., Jr. A comprehensive review of partial anterior cruciate ligament tears. J Bone Jt Surg Am. 2009;91(1):198–208. 8. Barrack RL, Buckley SL, Bruckner JD, Kneisl JS, Alexander AH. Partial versus complete acute anterior cruciate ligament tears. The results of nonoperative treatment. J Bone Joint Surg Br 1990;72:622-4. 9. Sonnery-Cottet B, Chambat P. Arthroscopic identification of the anterior cruciate ligament posterolateral bundle: the figure of four positions. Arthroscopy 2007;23:1128.e1–3. 10. Dodds JA, Arnoczky SP. Anatomy of the anterior cruciate ligament: a blueprint for repair and reconstruction. Arthroscopy 1994;10:132—9. 11. Schultz RA, Miller DC, Kerr CS, Micheli L. Mechanoreceptors in human cruciate ligaments. A histological study. J Bone Joint Surg Am 1984;66:1072—6. 12. Bak K, Scavenius M, Hansen S, Norring K, Jensen KH, Jorgensen U. Isolated partial rupture of the anterior cruciate ligament. Long-term follow-up of 56 cases. Knee Surg Sports Traumatol Arthrosc 1997;5:66—71. 13. Roychowdhury S, Fitzgerald SW, Sonin AH, Peduto AJ, Miller FH, Hoff FL. Using MR imaging to diagnose partial tears of the anterior cruciate ligament: value of axial images. AJR. American journal of roentgenology. 1997 Jun;168 (6):1487-91. 14. Colombet P, Dejour D, Panisset JC, Siebold R. Current concept of partial anterior cruciate ligament ruptures. Revue de Chirurgie Orthopédique et Traumatologique. 2010 Dec 31;96(8):S329-38. 15. Sonnery-Cottet B, Chambat P. Arthroscopic identification of the anterior cruciate ligament posterolateral bundle: the figure-of-four position. Arthroscopy. 2007;23(10), 1128. e1-3. 16. Robert H, Nouveau S, Gageot S, Gagniere B. A new knee arthrometer, the GNRB: experience in ACL complete and partial tears. Orthop Traumatol Surg Res 2009;95:171—6. 17. Lorenz S, Imhoff AB. Reconstruction of partial anterior cruciate ligament tears. Oper Orthop Traumatol. 2014;26(1):56–62. 18. Tjoumakaris FP, Donegan DJ, Sekiya JK. Partial tears of the anterior cruciate ligament: diagnosis and treatment. Am J Orthop (Belle Mead NJ). 2011;40(2):92–7. 19. Pujol N, Colombet P, Cucurulo T, Graveleau N, Hulet C, Panisset JC, et al. Natural history of partial anterior cruciate ligament tears: a systematic literature review. Orthop Traumatol Surg Res. 2012;98(8 Suppl):S160–4. 20. Siebold R, Fu FH. Assessment and augmentation of symptomatic anteromedial or posterolateral bundle tears of the anterior cruciate ligament. Arthroscopy. 2008;24(11):1289–98. 21. Dallo I, Chahla J, Mitchell JJ, Pascual-Garrido C, Feagin JA, LaPrade RF. Biologic Approaches for the Treatment of Partial Tears of the Anterior Cruciate Ligament: A Current Concepts Review. Orthopaedic Journal of Sports Medicine. 2017 Jan 25;5(1):2325967116681724. How to Cite this article: Vaishya R, Vijay V, Vaish A, Agarwal AK. A Critical Review of the Management of Partial Tears of Anterior Cruciate Ligament. Journal of Clinical Orthopaedics Jan – June 2017; 2(1):27-30.